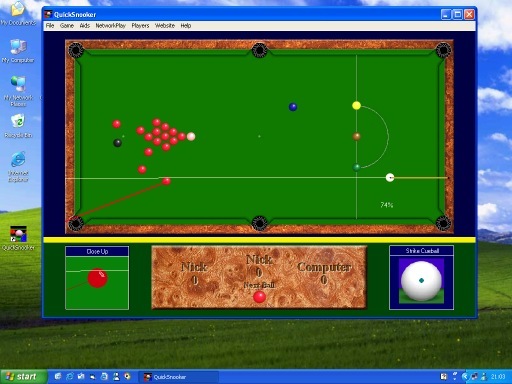 Snooker games and Snooker Pool Game for your Windows desktop ! download and play the best Snooker Game - Qucik Snooker here ! Snooker Game - Quick Snooker is truly a great, intelligent snooker game - it combines skill and strategy like no other billiard table game. If you're not familiar with the snooker game, do take the trouble to learn, I guarantee it will take you less than half an hour - and you will know and love this snooker game for the rest of your life. Quick Snooker is played with 15 reds and 6 'colours' and a 'white' cueball. It is a fast fun simulation. Snooker Game - Quick Snooker is played with 15 reds and 6 'colours' and a 'white' cueball. Each red is worth 1 point; Yellow 2 points; Green 3 points; Brown 4 points; Blue 5 points; Pink 6 points; Black 7 points. At the start of the snooker game the white (cueball) is placed anywhere inside the 'D' and player 1 'breaks'. You can play against a friend on one computer (taking it in turns) or against the computer (and you ought to beat him on the easy level!) or against a work colleague on your company network or against players from all over the world (by the magic of the Internet). The defualt snooker game setting is that two human players start play on the same machine, If you want to play the against the computer computer select the Players menu and then (for example) 'Player 1 versus computer (You Break)'. Move the mouse over the cueball; Hold down the left mouse button; Move the mouse smoothly 'away' from the cueball. *Note* and then Release - the Cueball will be 'Fired' down the white line. Move the mouse over the cueball; Click the left mouse (without moving the mouse ! ); Move the mouse smoothly 'away' from the cueball and then Click the left mouse button - the Cueball will be 'Fired' down the white line. To Cancel a shot, Use the right mouse button whilst dragging/moving; As with the real game it is possible to control the movement of the cueball after it has struck the object ball using spin; the current player is shown in the top centre of the score panel and their current break is shown underneath. If the white ball is potted you are required to reposition it with the 'D'. A white circle will appear, showing the proposed location - use the left mouse button to select your chose position, Dont rush it, and think about the shot you're about to take - you only get one chance to position the ball. 3D Live Pool Game - This snooker game simulates pool on your computer with full 3D environment and perfect 3D sound.